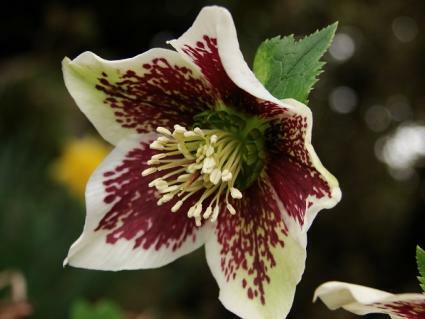 Hellebores - also known as Christmas roses or Lenten roses for their habit of flowering in winter and early spring - are a refined and popular shade plants. They are long-lived, low maintenance perennials and have unusual flowers that are almost incomparable. 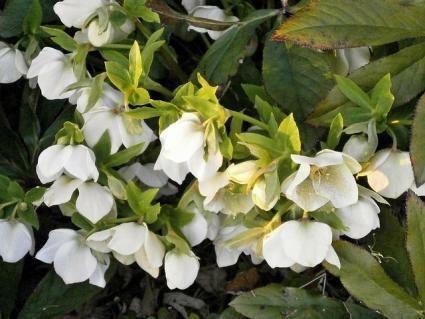 In mild, frost-free climates, one may find a hellebore actually blooming at Christmas time. But it's more accurate to say that they bloom very early - as soon as the snow melts and the ground thaws in cold climates and as soon as temperatures stay above freezing elsewhere. They are related to buttercups, not roses, and like many plants in this family they possess intricately divided leaves. Individual leaves and flower stalks emerge directly from the root crown, forming a clump that is usually no more than 16 inches tall and wide. The flowers are two to three inches across and vaguely rose-like, but droop downward from the stalks. They come in a variety of colors, including unusual ones like green and a purple that is so deep, it's nearly black. 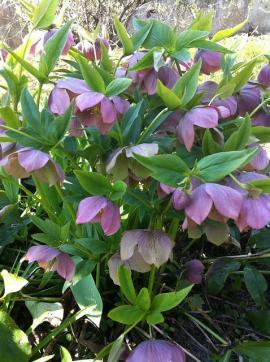 Hellebores tolerate deep shade in the hottest climates and full sun in the coolest places. Most often, however, they are considered a plant for partial shade. They like the rich soil found under mature trees and need regular water for the first year or two after planting, but afterwards are surprisingly drought tolerant if grown in the shade. Hellebores fit right in with cottage garden environments and are commonly included in shady borders with hostas, ferns, and Solomon's seal. Single plants are generally not as effective as a meandering row. Because of their short stature, hellebores are a good candidate for the foreground of a plant scheme and look great as informal edging along a curved garden path. 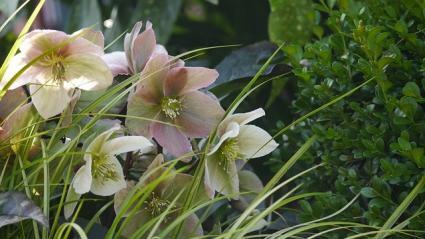 Hellebores don't ask for much other than being planted in the proper environment. Rich spongy topsoil, regular irrigation, and good drainage are the three simple keys to success. If these are met, pests and disease are virtually never an issue. A layer of mulch is very helpful and spreading an inch of compost around the plants each fall will support lush growth and prolific flowering. Though they are evergreen plants, the large individual leaves don't live forever and should be clipped at the base whenever they start to look shabby, which is common toward the end of the growing season. The spent flower stalks should also be clipped at the base to allow the beautiful foliage to hold the space through the summer. There are numerous species and cultivars with blossoms that exhibit exotic colors and patterns, though all share the same basic leaf and flower form. Boughton Beauty has rose-colored flowers tinged with green and unusual reddish foliage. Dusk is one of the many purplish-black varieties. Ivory Prince is known for its profuse number of creamy white blossoms. Harvington White has crimson splotches in the middle with white edges. Dido has large chartreuse double blossoms. The flowering of hellebores is a reminder that winter doesn't last forever. They are resplendent in a woodland garden and make a great cut flower for bringing indoors.